On a beautiful spring Sunday afternoon they tumbled expectantly into the fantasy world of Hoochie Coochie to hear the story of Alice. Our adopted Geordie superstar would soon be singing her heart out to ecstatic applause. Proprietor WT had taken care of business - prime seats reserved for BSH right in front of the band. And what a band! The Strictly Smokin’ had departed the HC stage, sound check done. One figure sat alone studying the charts in front of him. Bassist Michael Whent wasn’t available on the day and depping for him was one N. Harland. Oh, that’ll do nicely! Mad Hatters and March Hares, a Cheshire Cat, they were out in their glad rags drinking cocktails, a bottle of London Pride. At the appointed time MD Michael Lamb opened the pad at #16D – Ol’ Man River. Blistering, absolutely blistering, cue huge applause at this Hoochie Coochie Mad Hatter’s tea party. This the first tune of the first of three sets…Alice would soon be joining the party. A Night in Tunisia, Ray Chester’s arrangement of Autumn Leaves featuring Pawel Jedrzejewski (a fine big band guitarist, volume levels just right) and David Barnes on trombone developing his own fine solo, Mr Chester’s archive at Sage Gateshead comes into its own on an occasion such as this. Tom Kubis’ storming arrangement of Alexander’s Big Time Band tore the roof off the place with our US ex-pat trumpeter Pete Tanton blowing hard, so hard, as MD Lamb offered Keith Robinson, alto, an impromptu solo opportunity. KR nodded and proceeded to do some more damage to the bricks and mortar of no. 54 Pilgrim Street. And there’s more to tell…as Robinson stood up to solo all hell broke loose as an inadvertently knocked music stand caused a domino effect collapse in the reeds’ section. Members of the audience took to their knees to retrieve stands, instruments, sheet music, the whole shebang. And here’s the thing…the band played on and Robinson didn’t miss a beat. A memorable moment, marked by tumultuous applause! All this and we weren’t quite at the end of an eventful first set. The set closer – Four Brothers – featured the saxophones; Stan Getz, Zoot Sims, Herbie Steward and Serge Chaloff. Alright, on this gig Messrs Toms, Gowland, Summers and the destructive Robinson (only kidding Keith!) played the parts of the famous Herd. You’d have to go a long way to find a better section, exemplary is the word. So much excitement and to think this was just the first set! Some had their dancing shoes on – it’s almost de riguer on a SSBB Sunday afternoon at Hoochie Coochie. Twirling cocktails, a nicely chilled wine, a bottle of London Pride, the bar appeared to be doing good business. Band leader Michael Lamb juggles a million and one things on a day like this; marshalling the band, finding time to take a solo himself, and, this afternoon, arranging a Facebook live streaming of the performance. Phones lit up and there we were, taking Hoochie Coochie to the world! Alice arrived. Wow! A knock-’em-dead dress, heels, a real Puttin’ on the Ritz entrance! A lazy, lag-behind-the beat rendition featuring a becalmed Keith Robinson on alto. The dancers were up for it, soft shoe flats and spats, it’s 2018, they’re dancing to a big band, who said big bands were a thing of yesteryear? To say Alice Grace won enthusiastic applause doesn’t tell the half of it. Ecstatic, yes that’s it, ecstatic. And that was how it would prove to be for the rest of the afternoon. Paul Gowland on tenor accompanied our superstar vocalist on How High the Moon? as she flew high, higher than the moon. Awaiting the gentle descent of Ms Grace from stratospheric heights, the Strictly Smokin’ boys took the opportunity to pluck a tune from the Thad Jones/Mel Lewis’ pad. Groove Merchant, a bona fide jazz tune if ever there was one, once again highlighted the superb saxophone section. All seated, the reeds cannot help but impress. Exceptional stuff with the bonus of Jamie Tom’s superb tenor solo for good measure. Toms featured again, along with Keith Robinson, alto, on Maynard Ferguson’s Knarf. The SSBB is a ‘must hear’ band anytime but this Hoochie Coochie date was all about Alice Grace. And here she was again with three numbers to close out the second of three sets. I’m Beginning to See the Light, Ella’s early career success A Tisket, A Tasket (Alice oozing confidence as she sang to all parts, the room in the palm of her hand) and Get Happy. Happy? Delirious, more like. Bring on set three! And, before we knew it, set number three was upon us. Opus One got them up dancing, a Caravan rolled into and out of Hoochie Coochie with Alice back on the stand, and there she would stay for a simply marvellous version of You Turned the Tables on Me. 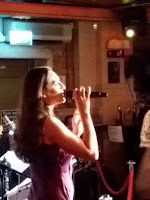 Our ‘jazz artist’ as one promoter rightly described Alice Grace said she had been so looking forward to singing Mean to Me with her Strictly Smokin’ boys. Yet more spine-tingling stuff. Could we have a fourth set, a fifth? Alice and the boys declared Alright, Okay, You Win as Ms Grace, eyes sparkling, sang her heart out. Wow wee!!! A final number – Honeysuckle Rose – from our superstar vocalist belatedly introduced the SSBB’s depping bass player. Neil Harland led off on Fats Waller’s late twenties number. It should be noted that NH didn’t miss a trick all afternoon, a class player is Neil. Pete Tanton played it muted as Alice scatted like nobody’s business. 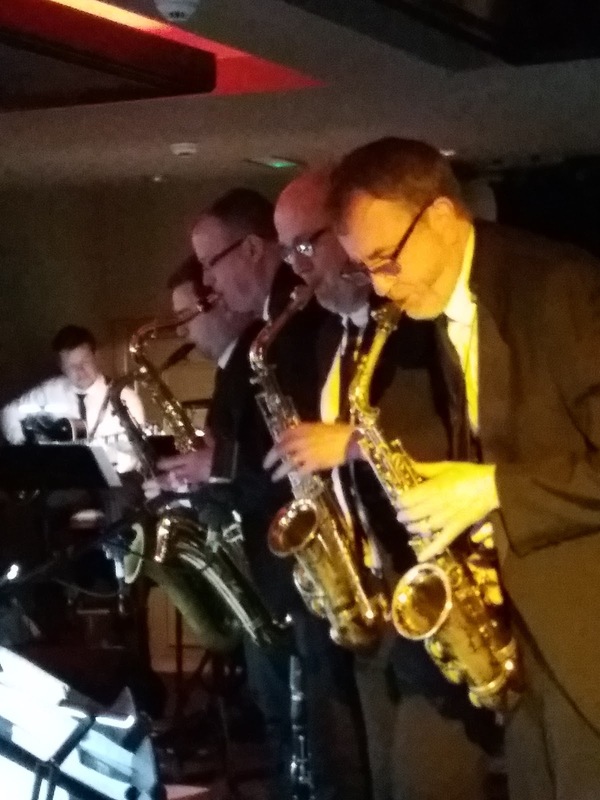 The Strictly Smokin’ Big Band doesn’t do other than triumphant and this Hoochie Coochie concert rates as one of their best ever performances with, of course, Alice in Wonderland.